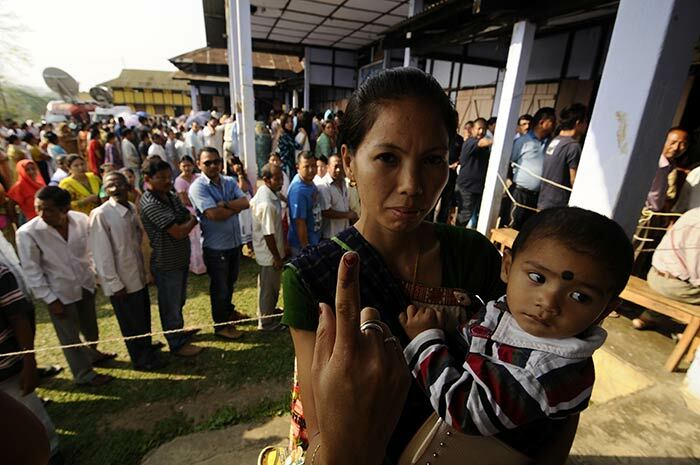 In phase four of Lok Sabha elections, seven constituencies in Goa, Assam, Tripura and Sikkim went to polls to decide the fate of 74 candidates. 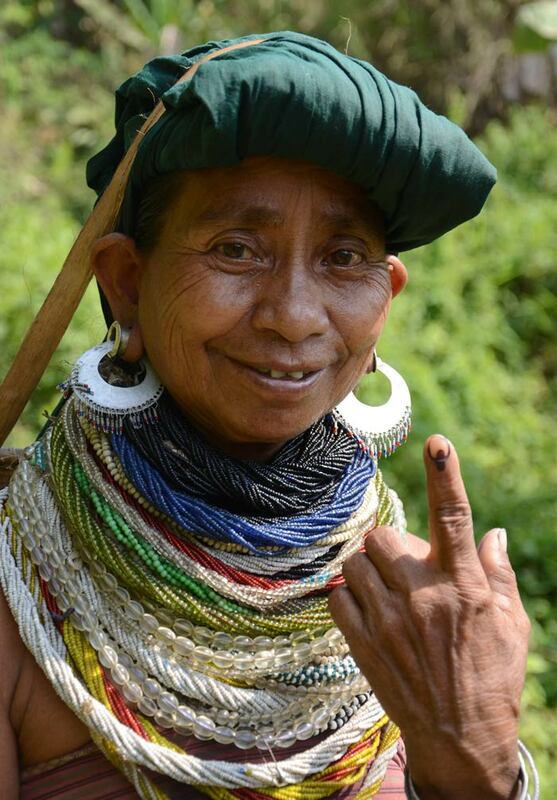 A Reang tribal woman displays the indelible ink mark on her finger after casting her vote at a polling station in Khowai District, about 120 kilometers northeast of Agartala, Tripura. 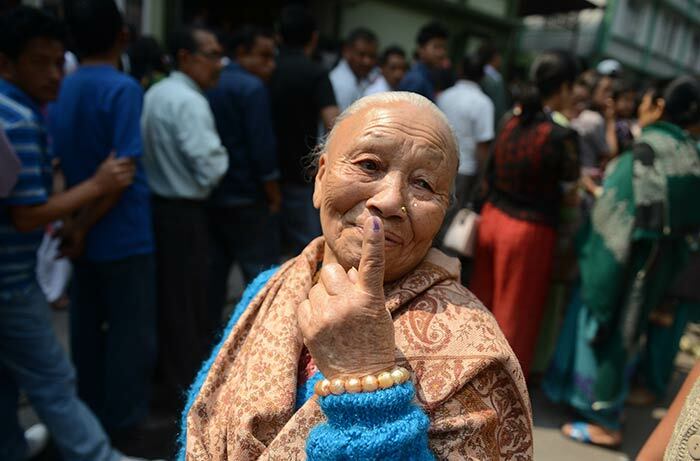 An elderly Sikkimese woman shows her finger marked with voting ink after she cast her vote at a polling station in Gangtok, Sikkim. 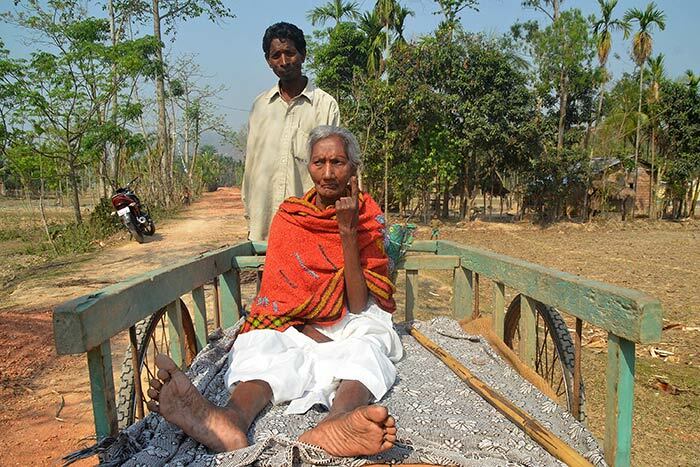 A woman voter sits on her son's cart after casting her vote at a polling station at Borkok, in Karbianglong district, Assam. 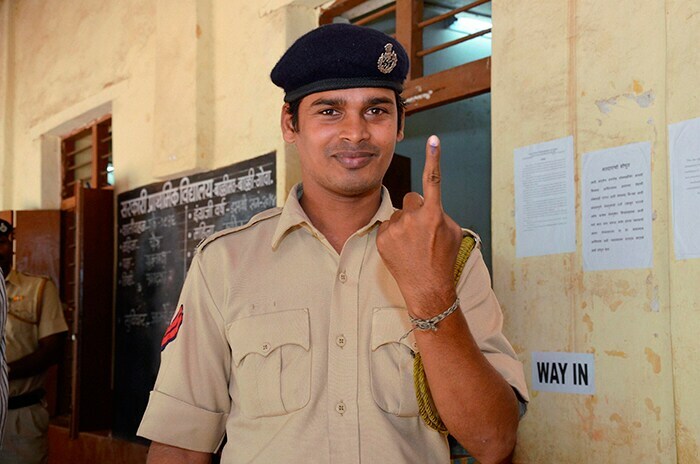 A police man shows his ink marked finger after casting his vote for Lok Sabha elections at a polling station in Panaji, Goa. 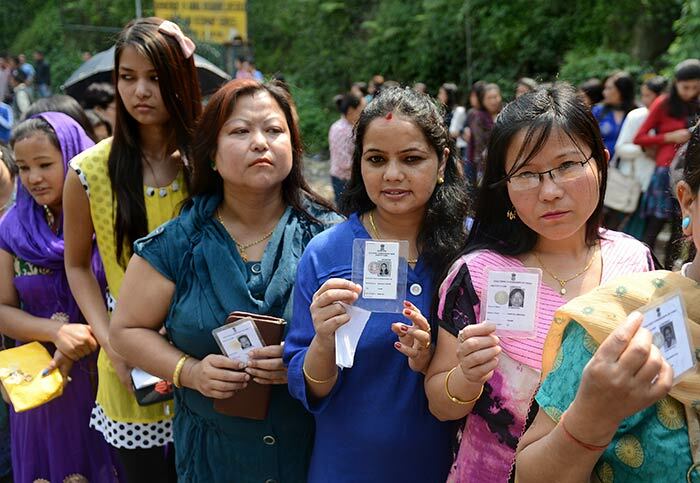 Sikkimese women hold their voter identification cards as they queue up at a polling station in Gangtok, Sikkim. 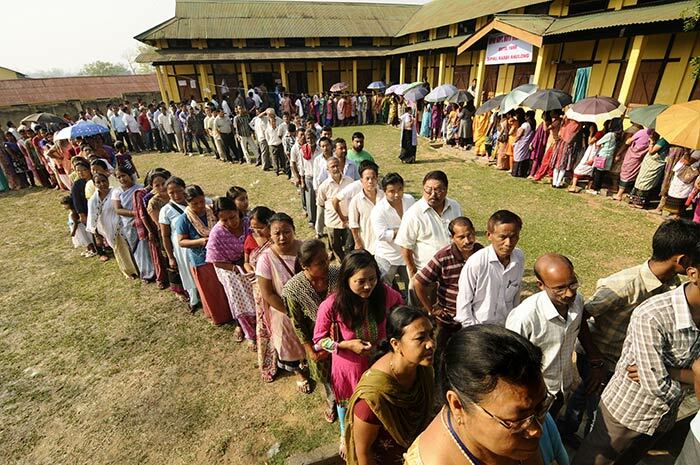 Voters queue up outside a polling station to cast their ballots in Diphu, some 252 kms from Guwahati, Assam. 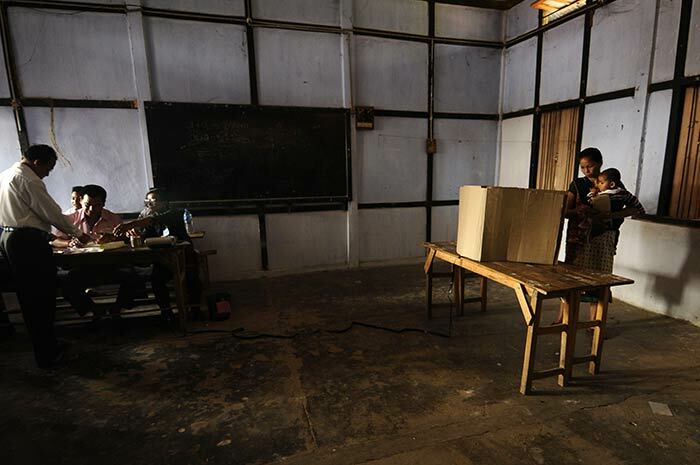 A voter casts his ballot at a polling station in Diphu, some 252 kms from Guwahati, Assam. A voter shows her ink-marked finger after casting her ballot at a polling station in Diphu, Assam. 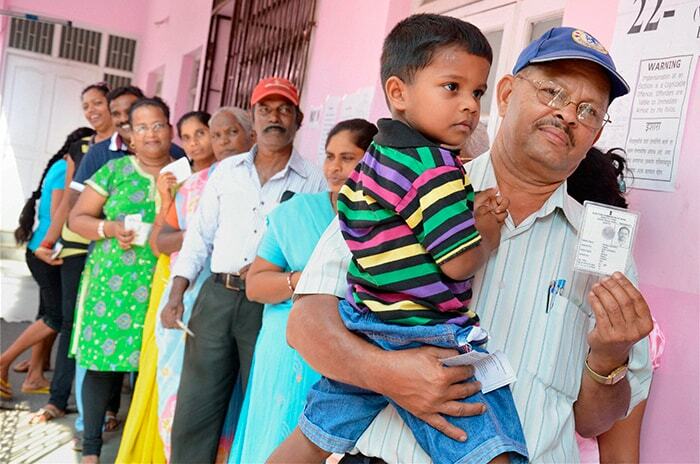 Voters wait for their turn to cast their votes in Panaji, Goa. 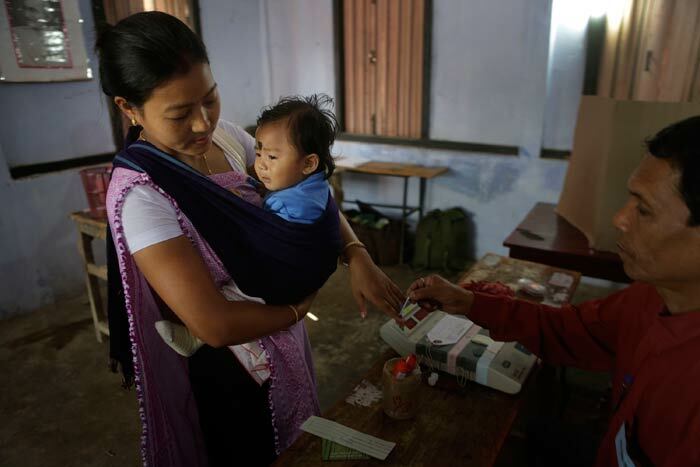 An electoral official marks the finger of a voter at a polling station at Noyapara village, 202 kms north of Agartala, Tripura. 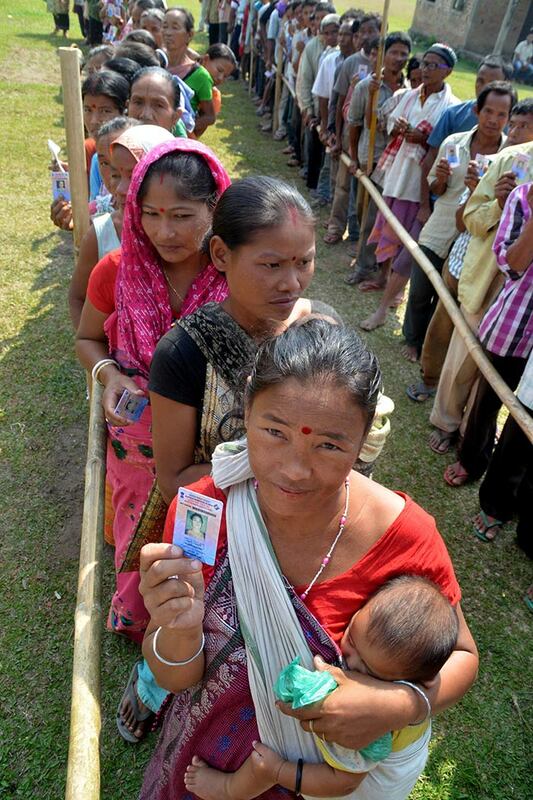 A Karbi tribal woman shows her voter id card as she waits in a queue at a polling station at Borkok, in Karbianglong district, about 250 kilometers east of Guwahati, Assam. 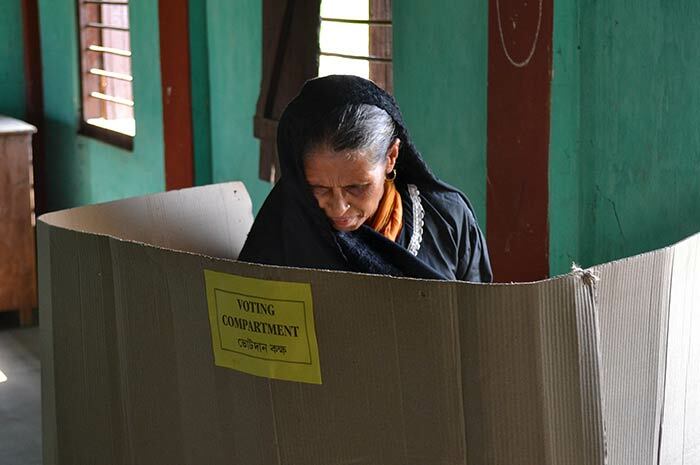 A Muslim woman casts her ballot at a polling station in Kurty, some 210 kms north of Agartala, Tripura. 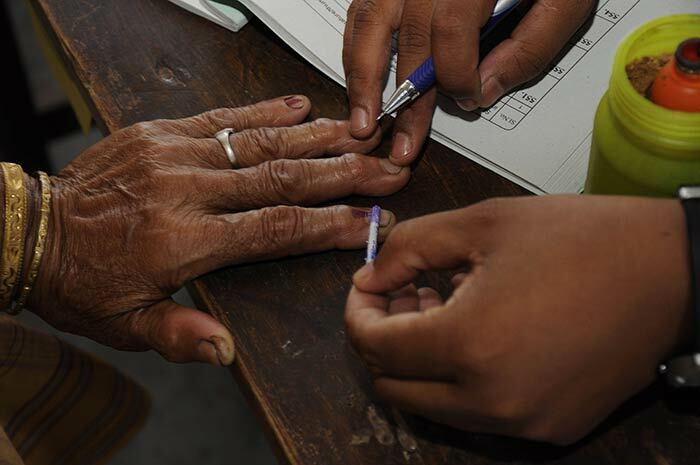 A polling officer marks the finger of a voter with indelible ink at a polling booth in Diphu, Assam. 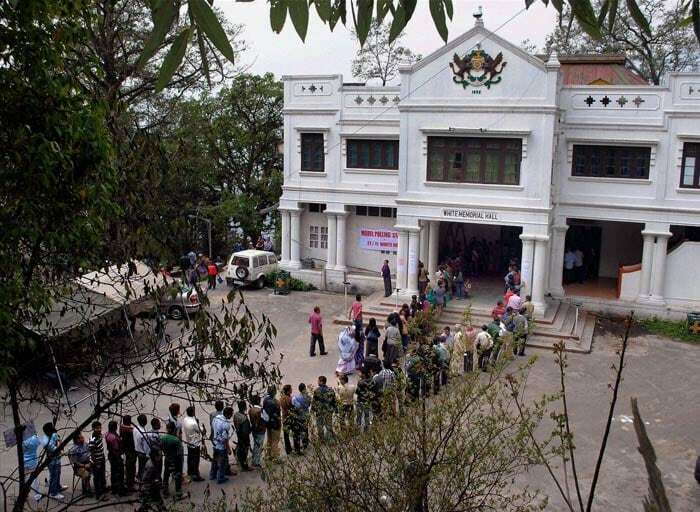 People wait in a long queue to cast their votes for Lok Sabha and Assembly polls in Gangtok, Sikkim. 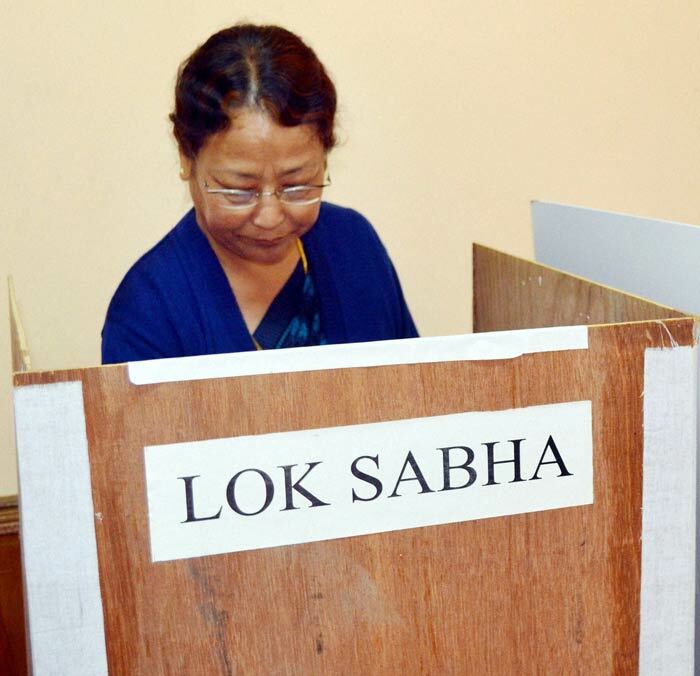 A woman casts her votes for Lok Sabha polls in Gangtok, Sikkim. 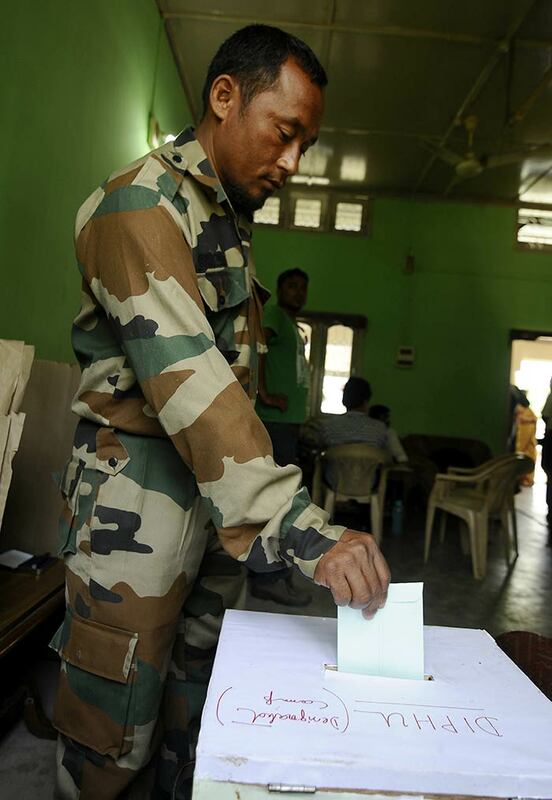 A cadre of Karbi Longri NC Hills Liberation Front, an insurgent group which has currently suspended operations as part of an agreement with the government, casts his postal ballot at a designated camp in Taralangshu, Diphu, some 252 kms from Guwahati, Assam. 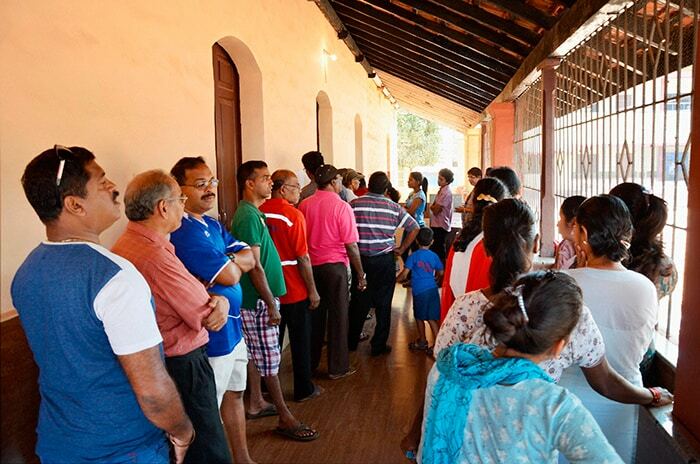 Voters wait in a queue to cast their votes for Lok Sabha elections at a polling station in Panaji, Goa.